Big and tough off-roader that will get the job done, SWB and LWB, some are seven-seaters, better engines than the previous version. Fairly crude on the road and feels cumbersome in town, some overworked and tired ones around. Facelift for 2005 now with 160bhp and Birdview satnav in top 7 seater versions. 5 seater S with CD, a/c and electric mirrors now starts at £24,500. All have 3.5 tonne towing capacity. 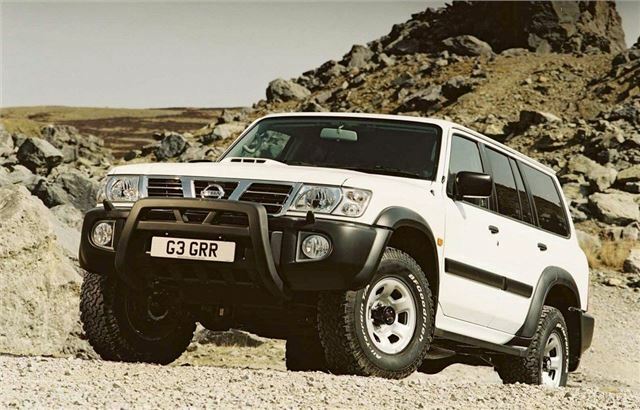 The fifth generation Nissan Patrol was the biggest and the best. Up there with the Toyota Land Cruiser in terms of its go anywhere ability, it was used by the United Nations and various army forces across the globe. Initially available with a 2.8-litre six-cylinder turbodiesel engine that was neither quick nor refined, things improved considerably in 2001 with the introduction of a 3.0-litre V6 diesel, which was no less economical but performed better and more quietly. In five-door form, the Patrol is huge. The long-wheelbase version is a whole 20-inches longer than the three-door, and immensely more practical, with eight seats and practical barn-style back doors. Sadly, UK buyers never got to experience the 4.5 and 4.8-litre petrol models.